If ever you’ve had doubts about microchipping your pet, this story will surely change your mind! 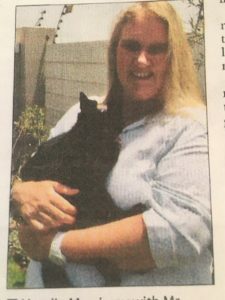 It was 17 years ago that Mr Mistoffelees, a beautiful black cat living in Newlands, Cape Town, went for a walk and never came back. He was just two years old at the time. His owner, Natalie Morrissey, was frantic. She put up laminated posters all over the neighbourhood, at the rugby stadium, at veterinary surgeries and at shops and contact the local SPCA and Animal Anti-Cruelty League. “I followed up with them daily for weeks and then called them weekly right up until I left Newlands a year later, ” she told The Tatler newspaper. Ms Morrissey never gave up on Mistoffelees, even after moving to Durban, Upington and Johannesburg. She returned to Cape Town in 2013 and kept driving back to Newlands in the hope of finding her lost cat. “Up until November last year I was still looking for him. My husband said it was time to stop, that he was in all likelihood long dead, given his age,” she said. So desperate was Ms Morrissey that she once picked up another black cat and took him to the nearest vet to have him scanned for a microchip. “It wasn’t Mistoffelees and I had to drive back to Newlands to put him back where I found him.” She even jumped out of an office window when she spotted a black cat in the garden. Then on January 12 this year she got the call she’d been waiting for for almost two decades. A veterinary surgery in Kenilworth had her cat. His microchip identified him. “I burst into tears and was in total disbelief. My poor has been on the road for 17 years”. Mistoffelees has myriad health issues due to his rough life on the streets but he’s thrilled to be home with his mama and meows to be picked up. A microchip is slightly bigger than a grain of rice. It is inserted under the pet’s skin via an injection-like device. It is harmless and painless and the procedure takes just a few minutes. The microchip contains a number which is listed on a database. The database contains information such as the owner’s telephone and cell numbers, address and other details. 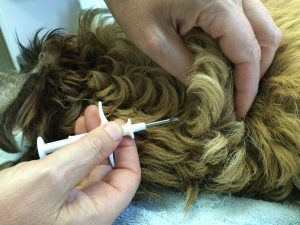 Most veterinary surgeries including EberVet Petcare Group clinics Country Animal Clinic in Somerset West and EberVet Pet Clinic in Strand, and some animal welfare organisations, have scanners. If your pet is found and scanned, the owner details show up immediately and you can be reunited with your lost pet.